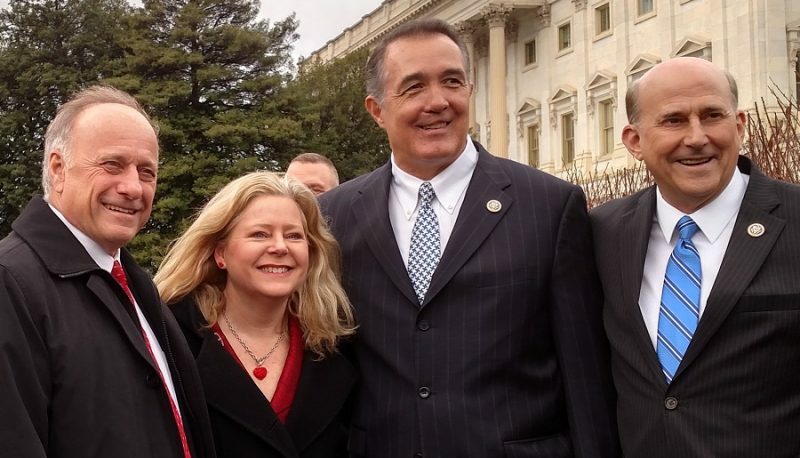 Anti-choice activist Janet Porter with Reps. Steve King, Trent Franks and Louie Gohmert at the introduction of a federal version of Porter's "heartbeat bill" in January 2017. Religious Right activist Janet Porter has been pushing her “heartbeat bill” – designed to criminalize nearly all abortions – at the state level for years. Now her congressional allies have introduced a federal version of the bill, hoping to take advantage of the election of the avowedly “pro-life” President Donald Trump. Porter and Rep. Steve King, R-Iowa, shared emceeing duties at a press conference they held outside the U.S. Capitol on Tuesday to celebrate the January 12 introduction of the Heartbeat Bill (HR 490), which has been referred to the Judiciary Committee. Joining them were several other Republican representatives: Trent Franks of Arizona, who infamously called then-President Barack Obama an “enemy of humanity” for his pro-choice stance; Louie Gohmert of Texas; Scott Perry of Pennsylvania; and freshman Don Bacon of Nebraska, a retired Air Force brigadier general. King and others said the legislation would establish a clear and specific legal point at which life begins. The bill would require any doctor to attempt to detect a fetal heartbeat before performing an abortion; if a heartbeat is detectable, it would be a criminal offense to carry out an abortion unless the pregnant woman’s life is at risk. 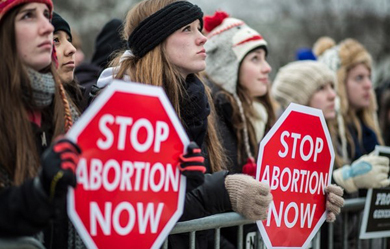 The legislation carries a penalty of up to five years in prison for an abortion provider. As Porter put it, riffing off a popular anti-choice bumper sticker, under this law “a beating heart will stop abortion.” She also reached for civil rights rhetoric, saying that if the bill passes “we will no longer discriminate against the very young.” While federal courts have struck down state heartbeat laws in Arkansas and North Dakota as unconstitutional, King said he believes there will be “new faces” on the Supreme Court by the time the law could work its way there. Created Equal’s Mark Harrington also lifted a phrase from Trump’s dystopian inaugural address, saying that the heartbeat bill was meant to address the “American carnage” of abortion. Harrington’s group runs “Killers Among Us” campaigns targeting abortion providers and companies that contract with them. Other speakers included Catherine Glenn Foster of the Charlotte Lozier Institute, the 501(c)(3) affiliate of the Susan B. Anthony List; Rebekah Gantner of the Eagle Forum Education and Legal Defense Fund; and Pat Mahoney of the Christian Defense Coalition. Asked whether King had any commitments from Republican leadership to move the legislation, he said there’s more work to do on that front.